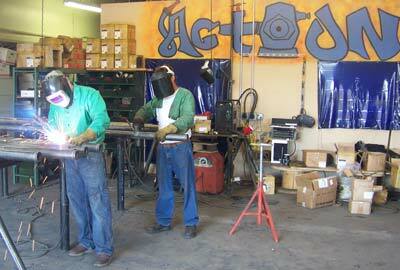 Action Fire Protection is experienced at providing service in many different work environments. We specialize in the installation of automatic fire sprinklers in two areas: 1) clean rooms and other biomedical facilities and 2) high-piled storage upgrades. Action Fire does it's own underground installation in-house. Click here to request a free list of satisfied customers! Action Fire Protection provides Fire Sprinkler Service Orange County for all cities in Orange County which are Aliso Viejo, Anaheim, Balboa, Brea, Buena Park, Corona Del Mar, Costa Mesa, Coto de Caza, Cypress, Dana Point, Dove Canyon, Foothill Ranch, Fountain Valley, Fullerton, Garden Grove, Huntington Beach, Irvine, La Habra, La Palma, Ladera Ranch, Laguna Beach, Laguna Hills, Laguna Niguel, Laguna Woods, Lake Forest, Los Alamitos, Mission Viejo, Monarch Beach, Newport Beach, Newport Coast, Orange, Placentia, Portola Hills, Rancho Santa Margarita, San Clemente, San Juan Capistrano, Santa Ana, Seal Beach, Stanton, Talega, Trabuco Canyon, Tustin, Villa Park, Westminster, and Yorba Linda. Zipcodes for our Fire Sprinkler Service Orange County are 92656, 92698, 92801, 92802, 92803, 92804, 92805, 92806, 92807, 92808, 92809, 92812, 92814, 92815, 92816, 92817, 92825, 92850, 92899, 92811, 92821, 92822, 92823, 90620, 90621, 90622, 90624, 92624, 92625, 92626, 92627, 92628, 90630, 92629, 92650, 92609, 92610, 92708, 92728, 92831, 92832, 92833, 92834, 92835, 92836, 92837, 92838, 92840, 92841, 92842, 92843, 92844, 92845, 92846, 92605, 92615, 92646, 92647, 92648, 92649, 92602, 92603, 92604, 92606, 92612, 92614, 92616, 92617, 92618, 92619, 92620, 92623, 92697, 92709, 92710, 90631, 90632, 90633, 90623, 92694, 92651, 92652, 92653, 92654, 92607, 92677, 92637, 92630, 90720, 90721, 92655, 92690, 92691, 92692, 92658, 92659, 92660, 92661, 92662, 92663, 92657, 92856, 92857, 92859, 92862, 92863, 92864, 92865, 92866, 92867, 92868, 92869, 92870, 92871, 92688, 92672, 92673, 92674, 92675, 92693, 92701, 92702, 92703, 92704, 92705, 92706, 92707, 92711, 92712, 92725, 92735, 92799, 90740, 92676, 90680, 90742, 90743, 92678, 92679, 92780, 92781, 92782, 92861, 92683, 92684, 92685, 92885, 92886, 92887.